Dr. Yashar Hirshaut has dedicated his life to fighting -- and winning -- the battle. Yashar Hirshaut was a baby when the Nazis came to power. He and his family - his mother, father and older sister - were living in Berlin at the time, looking for ways to flee the rising tide of anti-Semitism. When Hirshaut's mother saw an advertisement in one of the Jewish newspapers calling for professionals willing to move to the Philippines, she encouraged her husband to apply. He obliged and, a few months later, the family set sail for Manila. No one would discover it for a while, but it was then, during the eight years his family spent in the Philippines, that Hirshaut surmises his father caught the virus that would eventually kill him. The since-discovered Epstein-Barr virus is the apparent cause of a rare type of throat cancer that occurs most frequently in southeast Asia. Thirteen years later, after the family settled in Manhattan, a tumor appeared. "It was a horror," says the now-adult Hirshaut from his office on the Upper East Side, where he practices oncology. "An absolute horror...you really got to have a sense of how inhuman this process can be." Indeed, during his last year of college, in 1959, Hirshaut watched helplessly as his father rapidly deteriorated and finally died. "I said to him, 'I don't know who I'm going to ask all the questions I asked you over the years,'" Hirshaut recalls. "So he looked at me. He said to me, 'Life offers opportunities. Opportunities will come their way. Take advantage of them.'" Hirshaut's gravelly voice pauses for a minute. "So that's what I've been doing. Taking advantage of opportunities." Which is putting it mildly. Hirshaut has dedicated his life to fighting the war on cancer - a war that he believes will be won. Author of the renowned "Breast Cancer: The Complete Guide," whose fifth edition will be released by Random House in September, as well as founder and editor of the journal Cancer Investigation, Hirshaut runs a private practice in New York. He also teaches at Cornell University's Weill-Cornell Medical College and has consulted for the National Cancer Institute. But Hirshaut says the job closest to his heart is a volunteer position he took 22 years ago, first as president and now as chairman, of the Israel Cancer Research Fund. "We've been able to grow and grow and grow and grow," he says, "because of the importance of our cause." As chairman, Hirshaut oversees an organization that has become the largest single source of funding for Israel's cancer research. Since 1975, when ICRF was founded by the late Dr. Daniel Miller, it has distributed almost $35 million, financing cancer research by 1,600 scientists working in every major university and research institute in Israel and producing two Nobel Prize winners. For Israel, a country whose total budget for cancer research is roughly $10-15 million (compared to the United States', which is over $6 billion), ICRF's donation makes a difference. Indeed, two ICRF-funded professors, Drs. Howard Cedar and Aharon Razin, were just recently awarded the $100,000 Wolf Prize - Israel's equivalent of the Nobel Prize - for their work on gene expression and cancer research. Hirshaut believes that Israel's scientists are a powerful investment. With the myriad of demands on Hirshaut's time - a wife and a sizeable family, as well as a schedule that keeps him working until 1:00 a.m. several nights per week - it's a wonder that he was interested in the time-consuming, non-paying ICRF position in the first place. But Hirshaut believes that Israel's scientists are a powerful investment. "It's still true in science that it is the clarity of thought and motivation that can make a very big difference." In other words: it's not just about the funding; it's about the drive. Which Israel has in spades. After graduating from Albert Einstein Medical College in 1963, Hirshaut completed his medical training at the National Cancer Institute in Bethesda, Md., and ultimately headed a lab at Memorial Sloan Kettering in Manhattan, where he researched human tumors, fibrology and immunology. There he met the late Miller, who wasted no time asking the up-and-coming doctor to volunteer for a new project he had started: ICRF. 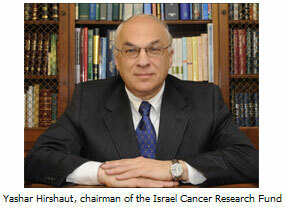 Hirshaut served as ICRF's president for 20 years before he took over as chairman in 2005. The position involves overseeing the overall operations of ICRF, mobilizing the staff into a cohesive team and selling the mission to supporters and potential donors. "Dr. Hirshaut keeps the heart of ICRF beating with his selfless devotion and passion," says Harriet Elisofon, president of ICRF. "He believes that we will soon find a cure for cancer and supporting the research of our scientists in Israel is key to reaching this goal." ICRF has flourished far beyond what anyone could have imagined back when it was founded in 1975. For instance, in 2004, two ICRF-financed professors, Avram Hershko and Aaron Ciechanover, won the Nobel Prize for their work with multiple myeloma - which led to a drug called Velcade. In the early 1990's, Drs. Moshe Oren and Varda Rotter discovered the role played by a gene called p53 in suppressing the growth of tumors. According to Hirshaut, p53 has been called "the gene of the 20th century" because it controls cell growth versus cell death. (Most cancers result from a mutation in the gene.) Professor Ephrat Levy-Lahad discovered that a single mutation in the RAD 51 gene determines how likely it will be that women carrying the breast cancer gene BRCA2 will actually get cancer - a correlation that has become especially important for Ashkenazi Jewish women. Dr. Alberto Gabizon developed a new drug called Doxil - used in treating breast and ovarian cancer - and Dr. Eli Canaani played an important role in the development of Gleevec, the first drug to directly target cancer cells. And yet, as anyone whose life has been touched by cancer can attest, despite all the work being done in the battle against this deadly disease, it still often feels as though more and more people are contracting it. In other words: it still feels like cancer is winning. Hirshaut, however, disagrees. What's really happening, he says, is that people used to die from less serious diseases, such as tuberculosis, mumps, measles or bleeding ulcers. "As infectious diseases have come under better control," he explains, "people grow older and get into the cancer area." "What I can do now as an oncologist is far greater than what I could do 30 years ago. There's no comparison." But even in that area, he says, science is winning the battle: "We're making tremendous discoveries and what I can do now as an oncologist is far greater than what I could do 30 years ago. There's no comparison." By way of examples, Hirshaut cites testicular cancer, which usually occurs in young males in their most fertile years and whose cure rate is 92 percent - compared to about 25 percent in the 1970's - as well as Hodgkin's Disease, which at one time was an almost certain death sentence and whose cure rate is now 72 percent. "When I first came to Sloan Kettering," Hirshaut says, "all the known [cancer] drugs were in one little medicine cabinet." And before that, he says, as an intern, nobody wanted to be on the cancer floor - not even the head of the department. But, he continues, there were also moments of hope. "I saw people being cured of leukemia and Hodgkin's - I saw that it was possible." Indeed, one of Hirshaut's most inspiring moments in cancer research happened just a few years ago, when a drug called Herceptin was introduced to the medical world. Herceptin has been shown to reduce the risk of breast cancer recurrence by 52 percent. "There were 15,000 doctors [in two huge meeting rooms], people who are skeptical about everything," Hirshaut says. But when the drug's studies were announced, all 15,000 doctors stood up and applauded for 10 minutes. And yet, for Hirshaut, the success in the fight against cancer relates to more than merely an increase in effective drugs. He says there's been a paradigm shift in research because scientists are finally understanding just how cell growth occurs. "[We're finding out] more and more how growth is controlled, how change is controlled and the drugs we're working on are drugs that are directed against specific pathways of growth that have gone wrong. What we're trying to do is correct a pathway that's corrupted." In other words, scientists are trying to pinpoint the precise moment at which problems or abnormalities go off in the cell and then undo them. "It's our ability to reverse engineer the cell...that is permitting us to be much more sophisticated," Hirshaut says. "And when we work at that sophisticated a level, we'll find the answer." In some ways, it's easy to see where Hirshaut finds his optimism. An Orthodox Jew who attended yeshiva throughout most of his childhood, Hirshaut says that his faith is an integral part of his work. "It gives you a system of values," he says of Judaism. "It tells you that human life is important." Hirshaut likes asking the same questions of Judaism that he asks of science: how does this all fit together? And, sure enough, "the pieces come together." Hirshaut spends the next several minutes discussing a question about the Haggadah that's intriguing him and throws in a midrash or two for good measure. He quotes the Talmud in the same breath that he rattles of the newest therapies in cancer treatment because, for him, it's all connected. In fact, Hirshaut says he likes asking the same questions of Judaism that he asks of science: how does this all fit together? And, sure enough, "the pieces come together," he says. "[For] people who live by their own value system," Hirshaut explains, "it's much easier to convince themselves - O.K., so [the patient] lives a little bit less. They're old; forget about it. But everybody's old in a different way. For the 26-year-old intern, 65 might be old. But the 65 year old doesn't feel old, he feels O.K." Hirshaut might as well be talking about himself, since he doesn't seem to have plans to retire any time soon. But he's also fairly vague about the next step in his life. "We never know," he says, thinking back to his father's premature death. "Every day comes with a certain stress and you wonder how you're going to do what you have to do." But, he says, "The Good Lord helps." Even with his faith in God, though, doesn't he ever get depressed? Yes, he sighs deeply. Of course it's easy to get depressed. Hirshaut recalls driving home from work one night, weighed down by an especially difficult case. But suddenly he was struck by a realization: if he, the doctor, was immobilized by depression, there was no one left to help the patient. "Who's going to get the patient out of this hole? Who's going to get him out of this terrible situation?" he asked himself. "So I said enough depression, let's see what we can do to try and rescue the patient." In the Talmud, there is a phrase: "Tov she'b'rofim b'gehenom" - the best of the doctors go to hell. For some, the phrase is an indictment of the medical profession. For Hirshaut, however, it's the opposite. "If the patient is very sick and he has the experience of hell," Hirshaut explains, "the good doctor is the one who climbs down to join him and pulls him back up out of his suffering. That's the mission of the doctor: not to get overwhelmed with grief but, as everybody in a war has to do, help fight the battle. To win the day." Mindy Schiller is the assistant editor of World Jewish Digest. The Jewish Ethicist: All's Fair in War? I was very uplifted by your article. You have given me hope so that I can continue to encourage my daughter who is fighting breast cancer. I just want to thank God for people like Dr. Yashar Hirshaut. He is a blessing to so many people who are fighting cancer. I am a mother of a daughter who was diagnosed with breast cancer in 2002. She was 32 years old at the time. To make a long story very short, she was cancer-free for almost 6 years. It came back into her breast bone in Dec of 2008. She received radiation at that time. The cancer reappeared in the lymph nodes in her neck in Sep of 2010. Surgery and radiation were done in that area. At that time, the cancer had changed from "estrogen" to HER2 . An MRI was given to her very recently to check her liver due to blood results. The liver and all other organs were fine, but very small bone lesions were detected in two ribs, L1, pubic bone and in both hips. She is on the new drug Xgeva and will be starting on Herceptin and Doxil this coming week. She is being treated at the Arizona Cancer Center in Tucson and her radiologist oncologist is at the University Medical Center in Tucson. Both of her oncologists are wonderful doctors. I pray that I can control my depression like you are doing so that I can help my daughter fight this for the fourth time. God bless you Dr. Hirshaut and all others who are desperately trying to find a cure. Dr. Elise Kohan, and NIH staff have been my family during my darkest hours. I was motivated,mentored by such wonderful people in 1980,1986,1993, and my last Bone Marrow Transtplant. I really believe God was the one through these scientist that repeatedly saved my life, when so many other's perished. I need to always thank God for his incrediable blessins. I had Breast Cancer and I am an activist.,I am also, a survivor. I urge every woman to go for their mammograms.They saved my life.I also,a Breast Cancer activist.I make the ribbons and get them out for my way of fighting the disease.The proceeds go to the Susan G.Komen Foundation. Through Redemption to bring Moshiach NOW! I lost my father to throat cancer. Recently, my best friends'' wife died from stomach cancer. My best friends are observant Jews from Lakewood, NJ. I don''t live near them yet through a quirk of fate I befriend them and have come to admire and respect them enormously. My friendship with several of them goes back almost 20 years. is that problem is not its solution (a forgone conclusion) but just when and how. Mazal tov to you and your organization. In 1931 Dr. Otto Warburg received a Nobel Prize for curing Cancer, What Happened? In 1931 Dr. Otto Warburg received a Nobel Prize for curing Cancer, What Happened since then? I have copies of the materials upon which the nobel prize was based if anyone wants them. I read an article on line about an Italian doctor and an American doctor who said that they are curing cancer with baking soda, that all cancer is white and white is yeast. They have written books about this. I want to know if this is true. Thanks. Hi, since I do this thing with language I noted a long time ago that within the word CANCER is aurally: Answer. I do so fervently hope we find more and more answers to this troubling. sorrowful and so difficult disease, which has, many forms and I have deep hope that science will provide that answer. As indicated in this article, we have more and more ways of helping people and for some forms of cancer once considered incurable, there are major advances in treatment. My husband does cancer research and works on many genetic diseases. I have also witnessed some amazing reports by people who claim to be cured in unorthodox manner and for me, it''s difficult at present to understand this. So it''s something I am looking into, like tong ren, a very unusual healing method,totally non invasive, looking like voodoo and yet so many people say this has remarkably helped them, has even produced remissions and "cure". If it works I say, why not? Try something that will not harm you in the least and you can also continue your medical regimens. I cannot evaluate these things. I do know that there is so much human misery and I hope we can continue to ameliorate these problems. It does seem we expect we will, and that all science is predicated on answers being discoverable and that uncovering. I feel, deeply, that those who leave, meaning die, depart...that for them there is something of beauty and love on the "other side", that tunnel so often described by so many who have "come back", feeling embraced by the light. It''s imponderable that people need to suffer in the ways they do, but I take refuge in a greater story involving us all that is ultimately, entirely, about LOVE. Perhaps it is pure Shakespeare, and we dust ourselves off on the other side, and ask for our next role, and yet, somehow, by some alchemy, we also retain our identity as souls on this, most immense journey. Here''s something interesting about language: do die the word has an aural equivalent and that is dye. When we dye something we change its color or hue. So might one say that dying is to change one''s hues, meaning YOUs. There is something that is both poetic and deep about language and I am following language in all that I do. I take hope in this as dovetail itself is for pieces that fit together so perfectly and then dove tale is about, well I think, PEACE. This is a wonderful article about a wonderful man, whose life was certainly informed by the sad and terrible death of his father from cancer. The phoenix fortunately does rise from the ashes and this is very important and honorable work. rEADING THROUGH THIS PIECE HAS GIVEN ME HOPE THAT SOMEDAY, MEDICAL SCIENCE WILL HAVE A BREAKTHROUGH IN ELIMINATING CANCEROUS CELLS FROM THE HUMAN BODY. MY MOTHER DIED OF BREAST CANCER IN JANUARY. MAY GOD HELP THE RESEARCH TEAM.